On October 20, 2011, a young California man, who was employed as a union carpenter for Ghilotti Construction, fell and injured his back while working on a bridge. The incident occurred as the result of a piece of uncapped rebar snagging the worker’s pant leg and causing him to fall. He was wearing a 50 pound utility belt at the time of the fall, and his leg remained about two feet in the air, both of which exacerbated the injury he sustained. The carpenter (plaintiff) did not report that he was injured at that time, but his foreman observed the fall and remarked that it looked like it hurt, although he denied making the comment later at trial. The plaintiff and the foreman both testified at trial that workers did not like to report workplace injuries for fear of reprimand and/or losing their jobs. The plaintiff returned to work the day following the incident, but became concerned when he was unable to lift a 20-pound pipe, an action that he normally could complete with ease. The plaintiff’s foreman claimed that the plaintiff said that he had been hurt at home and that he was not aware of any injury sustained at the job, but that claim was negated when the foreman’s friend and neighbor testified that the foreman knew of the injury and was concerned about losing his job for letting it occur on his shift. The plaintiff sought medical care about 10 days after the incident occurred. He was diagnosed with bulging and protruding discs at L4-5 and L5-S1. He reported pain at a level 9/10 over the next several months and tried to relieve the symptoms by taking pain medication and engaging in physical therapy. The plaintiff also reported using alcohol to assist with pain management. In February, 2012, the plaintiff underwent back surgery to help relieve the pain and restore his functioning, but the surgery had less than optimal results. Neither narcotic nor non-narcotic medications were relieving his 7 to 8 level pain, and he continued alcohol use for relief. In September 2012, in anticipation of another back surgery, the plaintiff discontinued pain medications and alcohol, but later went to the emergency room for both pain management and alcohol/narcotic withdrawal symptoms. Two days after the plaintiff was released from the hospital, he was involved in a single-car crash where he suffered head trauma and was in a coma for three weeks. When bystanders reached the scene, the plaintiff was having a seizure. It is thought that the accident was caused by the plaintiff’s seizure, and was not alcohol related as the defendants tried to claim. The second back surgery finally took place in April, 2014. In the interim, he was declared 100 percent disabled and lived on disability and support from his mother and his ex-wife. The defendants in this case were the general construction company, Ghilotti Construction, and the rebar company, Harris Salinas Rebar, Inc. At trial, it was determined that had the rebar been capped with the bright-orange plastic top as it should have been, the incident would not have occurred. The jury was tasked with determining the level of fault of each of the defendants regarding the fall, and also whether they should be liable for the damages sustained in car accident, which greatly impacted the disability status of the plaintiff. The jury found in favor of the plaintiff and awarded the him $10,791,332. The amount of this award was based on the medical costs incurred for both the fall and the car accident, and on the loss of income that the plaintiff will experience over his lifetime. Construction zones are dangerous places for workers and for pedestrians and passersby. There are more than 11,000 construction site injuries reported each year. Many of these injuries are catastrophic and result in workers losing their livelihood and their ability to function normally. As seen in this case, not all companies follow safety guidelines as they should, and they are often not penalized when they fail to do so. 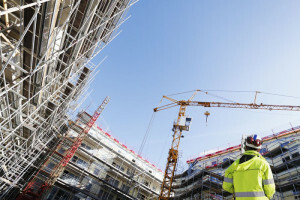 If you or someone you love has been injured on a construction site, hiring an attorney is the most advisable course of action to take once your medical needs have been documented. It is essential to see a doctor anytime you are hurt on someone else’s property in order to ensure your rights are upheld and that you can document fully any medical issues that you are experiencing. A California attorney can help both the victim and his or her family members, not only in securing the compensation that they are entitled to, but with finding resources to help with the emotional fall out as well.